Kombucha is a raw, living, fizzy sweet tea drink prized for its numerous health benefits. The earliest record of its use dates back to China’s Qin Dynasty (221 – 206 BC) where it was given names such as “The Tea of Immortality” and “Stomach Treasure”. It was later brought to Russia and Europe by travelers in the 20th century when it started to re-emerge in popularity after a disappearance during the sugar and tea rationing of World War II. Many people discovering kombucha, myself included, feel so good after drinking it that it quickly turns into a daily habit. Kombucha drinkers report many benefits from much increased energy, immunity to colds and flus to excellent digestion and even increased hair growth. Why is that? Well, here is some of what Traditional Chinese Medicine (TCM) has to say about kombucha. One of the main patterns seen by TCM acupuncturists in the modern world is a pattern called “Liver Qi Stagnation”. This means that the Liver energy is clogged, over-heated and excessive (although sometimes deficient) most often due to emotional stress and poor eating habits. Kombucha has a number of properties that make it an excellent remedy for the Liver system. TCM considers kombucha to be sour, bitter and warming. The sour flavour in TCM herbology and nutrition is used to cleanse the Liver and Gall Baldder. Similarly, Western science has identified a number of naturally occuring acids (think sour) in kombucha such as glucoronic acid which benefit the liver and have been found to prevent the build up of toxins in the tissues. These healthy acids have a similar effect as lemons which are acidic before being ingested but are transformed inside the body and in the end leave the body more alkaline, i.e. healthy. Kombucha’s bitter properties mean that it has the ability to improve circulation, reduce inflammation and clear toxins from the body. The bitter flavour in TCM also has the ability to prevent infection and prevent tumors. Kombucha supports the “Middle Burner Qi”, meaning the proper functioning of the Spleen and Stomach systems. The stomach’s job is to break down food. The Spleen system also has many jobs including extracting nutrients from the food to support the production of blood. When the Spleen system is “deficient” there are often sugar cravings. It’s interesting to note that fermented foods, including kombucha, actually work to reduce sugar cravings. Raw kombucha is probiotic containing live beneficial bacterial cultures which support the breakdown of food and digestion (for the full beneficial effects, always check that store-bought kombucha is truly raw – read labels and check for strands of the culture in the glass). G.T.Dave’s Kombucha is raw and unpasteurized. You can also use it to start a home brew. I don’t receive any money for saying this. 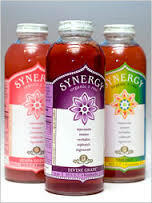 Being warming in its thermal nature, kombucha helps the Spleen system which prefers Yang (warming) food and drink. The Spleen system is often weak because of the Liver imbalances where the over-burdened Liver “attacks” the Spleen. So kombucha tea helps both organ systems. Warming food and drinks such as kombucha also help those is transition from a more meat and dairy type diet which is more warm to a vegan or raw vegan diet which is more cooling. The effervescent quality of the drink resembles soda pop and is used by many to overcome the craving for pop drinks. It is a sweet-tasting drink but the sugar content is very low (7 grams per 250mL). When the energy of the Spleen and Stomach improves, the side-effect is better immunity. In TCM, immunity relates to the Metal element which governs the Lungs. In the Five-Element cycle, The Earth element (Spleen and Stomach) is the “mother” of Metal (Lungs and Large Intestine). So when the Spleen and Stomach are healthier and stronger, they send their extra energy to nourish the Lungs to build “Defensive Qi” to fight off external pathogens such as colds and flus. While the body does need alkaline reserves, some areas of the body do need to be acidic to do their job. One such is the stomach lining which needs to have a pH of around 2-3.5 in order to be able to break down food. If Stomach acid is weak or lacking (which happens quite frequently in the modern age because of adrenal stress – the fight or flight response shuts down digestion) the result is poor absorption of nutrients causing malnutrition. Yes, this means that even if you are eating amazingly fresh, organic tree-ripened foods, if your stomach doesn’t have the acids to break it down enough to extract the nutrients, you will be malnourished. It’s not just what you eat, it’s what you absorb. Kombucha to the rescue! 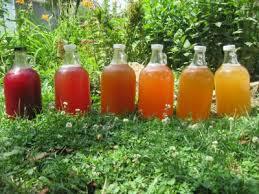 Kombucha has been found to contain seven plant acids as well as various B vitamins, vitamin C, enzymes and amino acids. These plant acids increase the acidity of your stomach lining which gives your stomach the ability to break down food. The improved Spleen and Stomach function from this drink results in improved athletic performance (the Spleen governs muscle tissue in TCM) as well as mental ability (the Spleen governs the intellect in TCM). People have also reported increased hair growth which would be because of improved nutrient absorption. 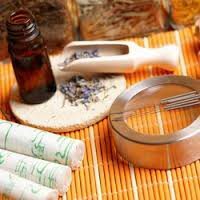 Dampness and Phlegm are TCM terms used to describe a Yin pathogen that shows up as discharges such as excessive vaginal discharge (leukorrhea), excessive nasal mucous (rhinitis), productive cough, watery swellings, wheeping discharges from the skin, and excess body fat. When pathogenic Dampness has been in the body for too long, it becomes hardened by the natural heat of the body and becomes Phlegm which appears as hardened nodules, lumps or tumors. Dampness and Phlegm produce stagnation in the body. Kombucha, which has similar properties to vinegar in TCM, is used to remove stagnation by moving Qi and Blood. For this reason kombucha has been used traditionally for cancer patients – by increasing the Qi flow, the body can resolve the dampness and phlegm. According to the ancient axiom in TCM, where there is Qi (energy) flow there is health, harmony, where there is no Qi flow there is pain, disease. **Please note: If you are a child, are pregnant, have a compromised immune system, or have kidney disease, it may be advisable to talk with your doctor before beginning to drink kombucha, especially if you are doing a home-brew. Kombucha can cause the body to detoxify strongly and pregnancy is not the time to begin to detox. If you have been a regular kombucha drinker before becoming pregnant than drinking kombucha while pregnant should not be a concern, however starting to drink kombucha after becoming pregnant is not advisable. Have you tried kombucha yet? Love to hear your comments and questions. I recently started seeing a TCM Practitioner and she diagnosed me with Dampness and Phelgm. But I have been following more of a Raw food program…so I was confused when she said that TCM does not believe in Raw Food. Hence, I am so excited to find your postings!! I love Kombucha. My question is, how much Kombucha do you have per day? How do you drink it? Cold or do you leave it out at room temperature before drinking? Make it a Coherent Day! HI Patrice, Thanks for sharing your excitement. 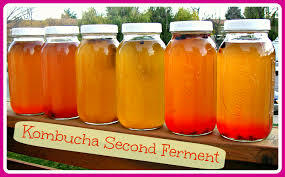 If you are new to kombucha you could start slowly, say a 1/2 cup in morning, 1/2 cup later in the day for example then build up to more because it’s quite detoxifying for the body and if you drink too much all at once it can cause detox symptoms (skin rashes for example) so just go gradually is usually the best way. I personally drink 2-3 cups per day (500-750mL). Yes you can drink it at room temperature. Raw kombucha is a live culture so when it’s left at room temperature it will continue the fermentation process. If left for a few days it will become extra fizzy (if capped) or if left for too long it will slowly turn more sour and vinegary which is not good for the tooth enamel. So I just leave it out for the day or you could leave it over night and drink it the next morning. Thank you for sharing your amazing insights regarding the energetic TCM properties of Kombucha. This might just be what I need. I was diagnosed with damp heat which is difficult to get under control – trying to help my liver imbalanced my spleen… so this drink sounds amazing. However when I click on the word “here” it redirects to a new page and there is an error message I would love more information on the Thermal Nature of Foods and I am particularly interested to know what causes the thermal nature to change. I live in China and I am having a hard time getting information from them. They tell me a boiled egg has a cold thermal nature as opposed to a fried egg. Please could you provide more information for me. Your information is incredibly interesting and I am addicted to your blogs! Thank you so much for all the powerful insights! Hi, thanks for your interest in my blog. As for eggs, generally speaking, they are warming, but of course, it’s relative, so the method of cooking also plays a role in the final result. Frying an egg with a lot of oil will be more warming than a lightly boiled soft-boiled egg. Roasting food in the oven is more heating than lightly stir-frying for a few minutes. In the summer when it’s more hot, the food should be cooler to bring balance so it’s better to lightly cook foods such as pan fry in water, or quick stir fry with just a little oil, whereas in the winter, stewing and roasting where the foods are immersed in high heat for long periods of time is more appropriate because it makes the food more heating which is needed in the cooler months.